Bandwagon Bad Boy vs. Pat Who? 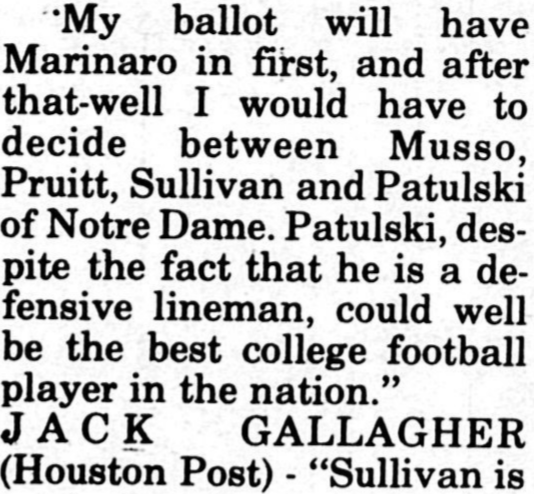 You’ll hear that Pat Sullivan’s performance in the 1971 game against Georgia pretty much won him the Heisman Trophy. After reading this, that’ll probably seem more right on than ever. 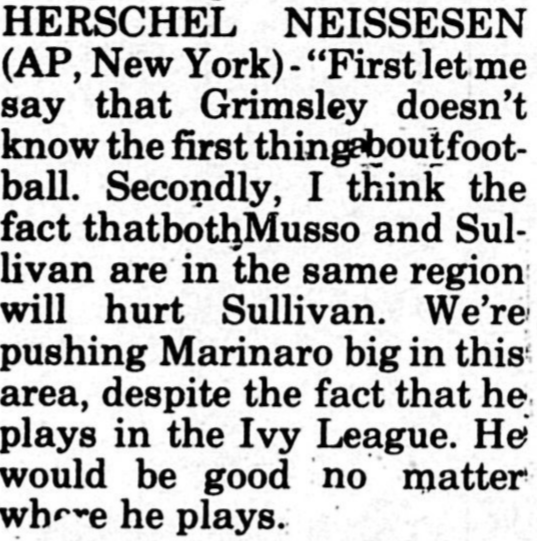 Because in early November, Joe Football Fan from Anywhere Other Than Auburn, USA probably would have put his money on Ed Marinaro, at least if the survey of national and regional sports writers the Plainsman conducted the week of the game is any indication. 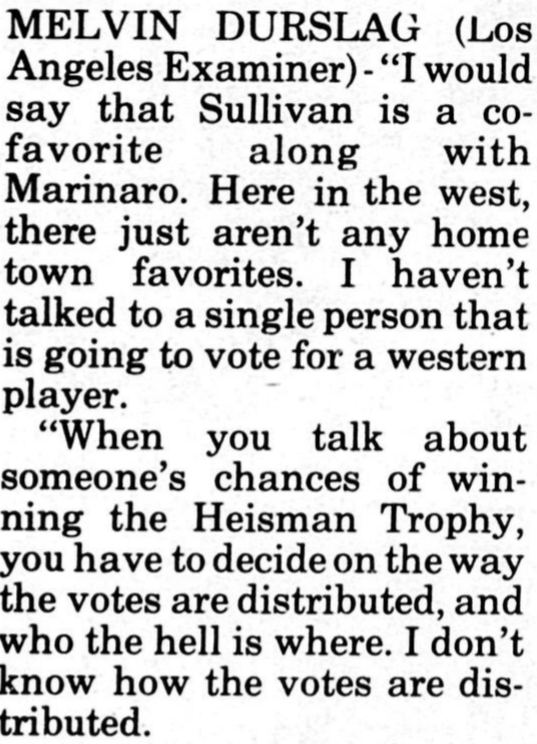 Despite preseason Heisman hype (fueled by his great Gator Bowl win over Archie Manning’s Ole Miss), Sullivan’s chances seemed to dwindle late in the season, for a variety of reasons. 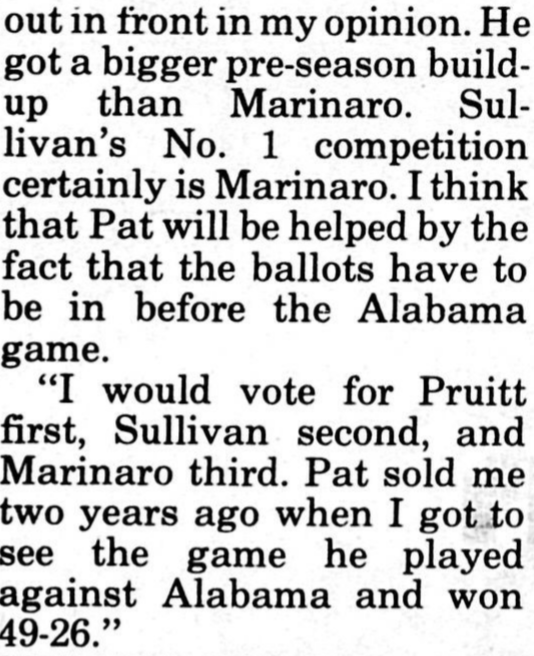 Thanks to an increasingly impressive season out of Alabama’s Johnny Musso, the southern vote that could carry Sullivan to victory over a strong contender like Oklahoma’s Greg Pruitt would likely be split. 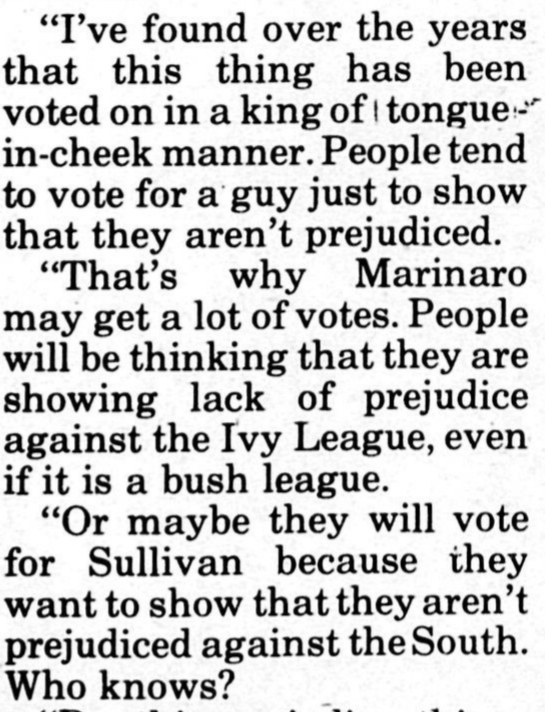 But the threat came mostly from Cornell’s—don’t laugh—Ed Marinaro who, thanks to bandwagon contrarianism, wound up on the Nov. 1 issue of Sports Illustrated. Want to prove you’re a writer with a mind of your own? Want a great week’s worth of underdog stories? Then go with the cocky kid from Cornell. His rushing numbers are off the charts! Sure, it’s the Ivy League. Sure, the Ivy League hasn’t claimed a Heisman in 20 years. Sure they’ve only had three in the trophy’s history. That’s what makes it so perfect. Parity. No favoritism. No prejudice. Power to the people. 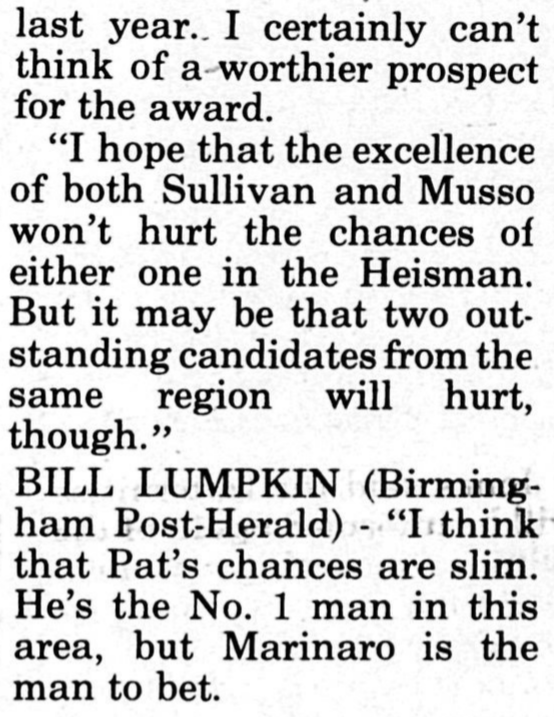 Even the Birmingham Post-Herald’s Bill Lumpkin thought Sullivan’s chances were “slim” in the wake of Marinaro Mania. The Georgia game would be his final shot to seal the deal, and with pretty much everyone watching. Undefeated Auburn was ranked 6th, undefeated Georgia was 7th; it was huge. 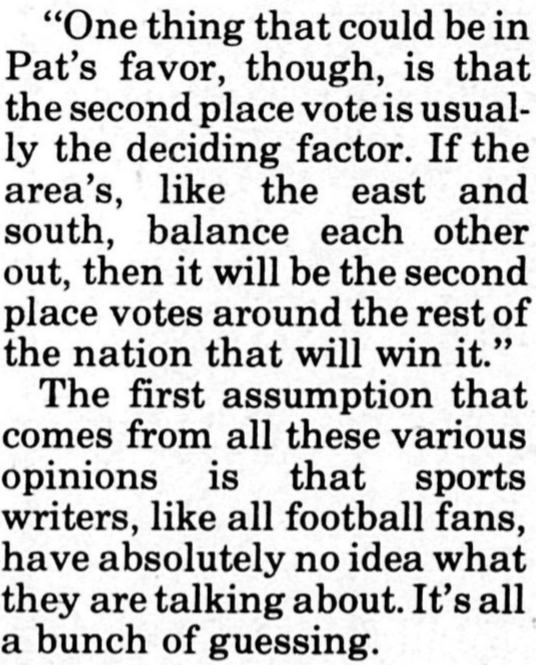 Despite the best efforts of Georgia students–and much to the chagrin of Howard Cosell–he delivered. 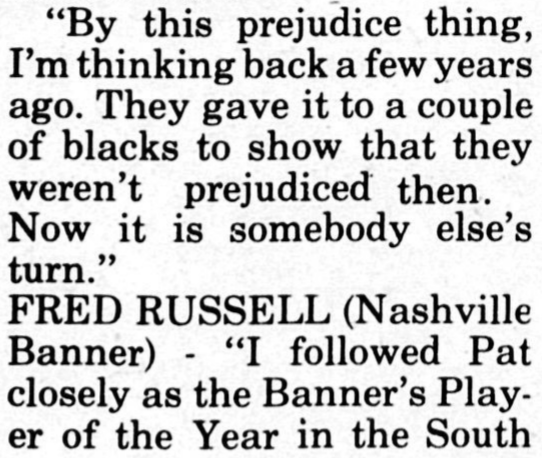 They rolled Toomer’s (because it didn’t start in 1972). 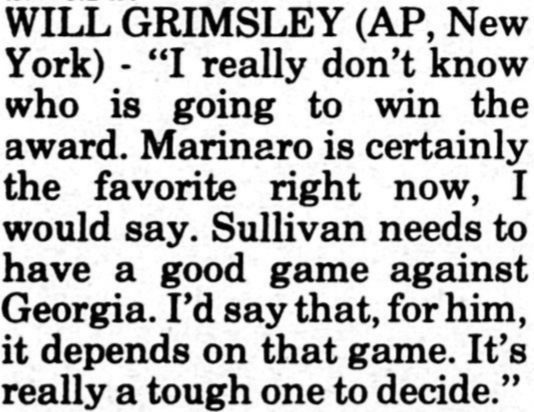 Vince Dooley called him the best college quarterback he’d ever seen. 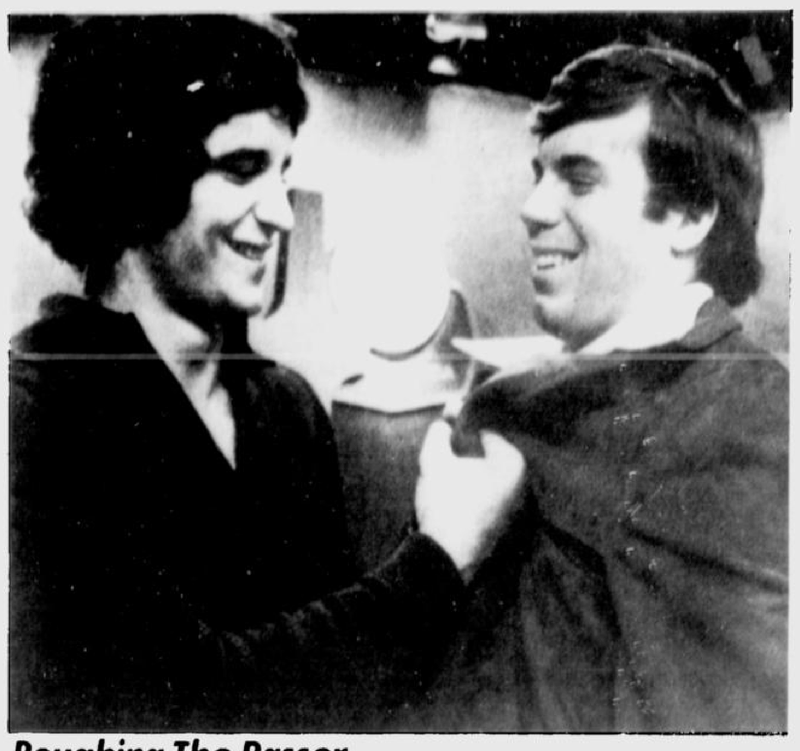 Marinaro went on to win the first Second Place Heisman Trophy. But you look at this and, man–an off game in Athens and things really could have gone another way.